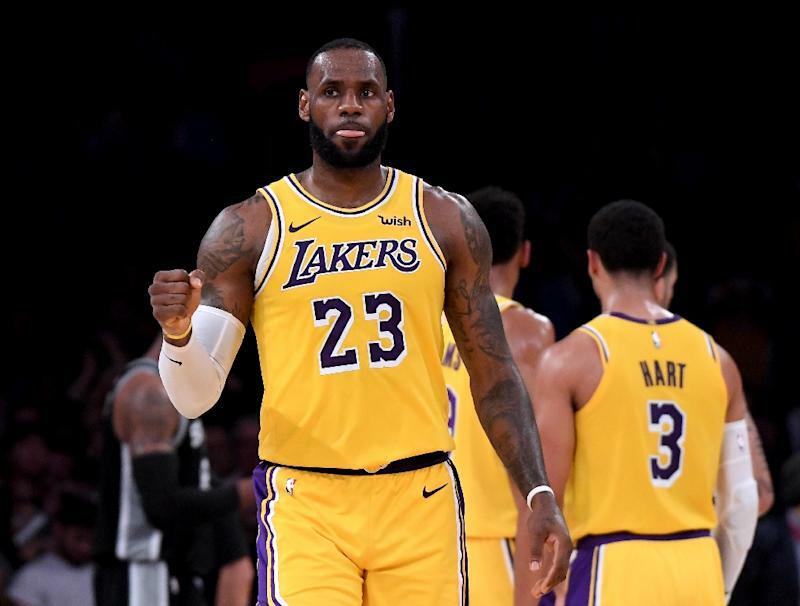 Los Angeles (AFP) - LeBron James had a triple-double in his first home win at Staples Center as the Los Angeles Lakers came from behind to defeat the Denver Nuggets 128-111 on Thursday. James had 28 points, 11 assists and 11 rebounds while leading the Lakers' late rally against the previously unbeaten Nuggets. "We got stops. They are one of the best offensive teams we have in this league and when you do that you are able to get out and run," said James, who posted his 74th career triple-double. It was the Lakers' second win in two days after struggling to an 0-3 start to the season. "Make 'em dance Lance. He was unbelievable coming off what he did last night," said James. "We picked up where we left off and got this win." Kyle Kuzma scored 22 points and JaVale McGee added 21 in support of James' triple-double -- his first with his new team. With Kobe Bryant watching from the stands for the first time since James's arrival in Los Angeles, the former Cleveland Cavalier James brought the Staples Center crowd to their feet with a go-ahead dunk with 3:31 to play. The Lakers won despite playing without suspended starters Brandon Ingram and Rajon Rondo. Ingram will miss one more game for his part in the Lakers' melee with the Houston Rockets last weekend, while Rondo returns Saturday in San Antonio. "We have gotten better through all of our games and we want to try to continue that against San Antonio on Saturday," said James. Elsewhere, Damian Lillard scored 41 points as the Portland Trail Blazers stayed ahead wire-to-wire en route to a 128-114 win over the Orlando Magic. Lillard scored 34 of his points in the second half as the Trail Blazers put up a rock solid defence and outhustled the Magic on the offensive end. Nikola Vucevic led Orlando with 24 points and 11 rebounds. Terrence Ross had 21 points off the bench and Aaron Gordon and Evan Fournier had 17 apiece. Ross kept the Magic within striking distance but the Trail Blazers compiled a 91-80 lead at the end of the third. The Magic cut the lead to three points but McCollum and Lillard combined for eight consecutive points to restore the double digit lead to 110-99. In Oklahoma City, Jayson Tatum scored 24 points and the Boston Celtics battled back from a 16-point halftime deficit to beat the struggling Oklahoma City Thunder 101-95. Marcus Morris added 21 points, Al Horford scored 19 and Kyrie Irving had 15 for the Celtics, who improved to 3-2 on the season. Paul George scored 22 points for Oklahoma City, who are winless on the season. Russell Westbrook shot just five of 20 from the field. He finished with 13 points, 15 rebounds and eight assists in the loss. The Thunder are one of only two winless teams in the league. Oklahoma City led 50-34 at the half but Morris nailed a three pointer with 27 seconds remaining to give Boston a 98-95 lead and they held on. "I got to do a better job to make sure we close the game. I take responsibility for what happened," said Westbrook.